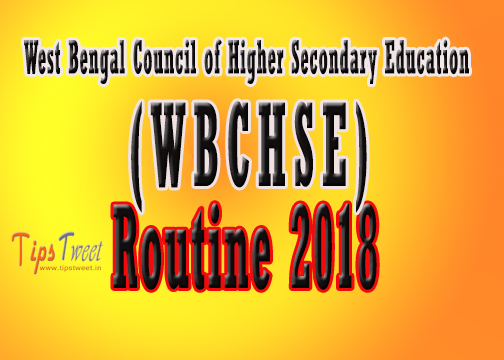 West Bengal Council of Higher Secondary Education board (WBCHSE) has announced the examination schedule (time table ) for class 12 (HS), which is scheduled to be held from March 15 to March 29, 2018.You can check subject wise exam routine online and download the PDF copy of date sheet for your reference. 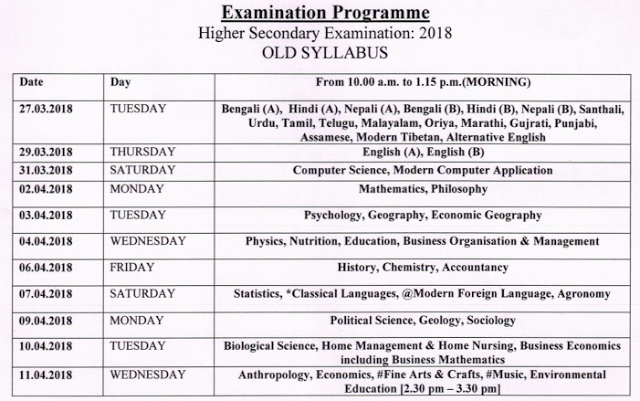 WBCHSE candidate for More details, Please go through the official website of WBCHSE Time Table: For Class 12 Exam Time Table Please click on the link WBCHSE. H.S. Exam Schedule for 2017 - 2018 Class- XII (WBCHSE) Uchha Madhyamik Examination (WBCHSE) Routine and Time Schedule (Higher Secondary) 2017 H.S. 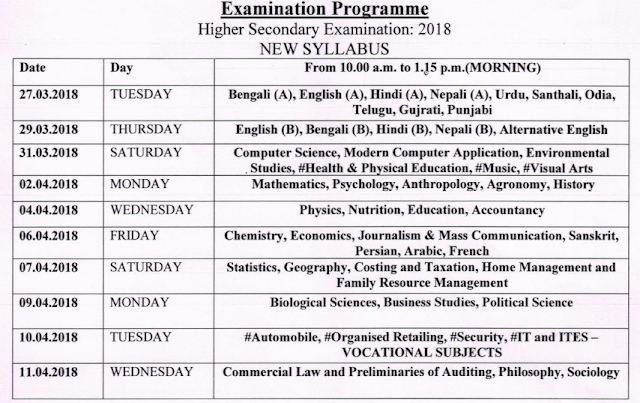 Exam Schedule for 2017 - 2018 Class- XII (WBCHSE) Uchha Madhyamik Examination (WBCHSE) Routine and Time Schedule (Higher Secondary) 2018. 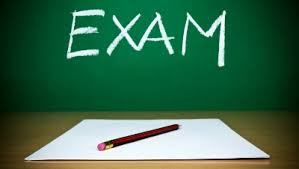 Students please visit the official website (http://wbbse.org) for more information for your MP Final Exam Schedule for 2017- 2018. • 12th March, 2018 (Monday): First Language (Bengali, English, Guajarati, Morden Tibetan, Nepali, Oriya, Gurumukhi, Tamil, Telugu and Santali). • 13th March, 2018 (Tuesday): Second language (English if English is not 1st language, Bengali or Nepali if English is 1st language). • 14th March, 2018 (Wednesday): Geography. • 16th March, 2018 (Friday): History. • 17th March, 2018 (Saturday): Physical Science. • 19th March, 2018 (Monday): Mathematics. • 20th March, 2018 (Tuesday): Life Science. • 21st March, 2018 (Wednesday): All Additional Papers / Optional subjects. 15.03.2017 (Wednesday) - Bengali (A), Hindi (A), Nepali (A), Bengali (B), Hindi (B), Nepali (B), Santhali, Urdu, Tamil, Telugu, Malayalam, Oriya, Marathi, Gujarati, Panjabi, Assamese, Modern Tibet, Alternative English. 18.03.2017 (Saturday) - Computer Science, Modern Computer Application. 21.03.2017 (Tuesday) - Psychology, Geography, Economic Geography. 22.03.2017 (Wednesday) - Physics, Nutrition, Education, Business Organization & Management. 24.03.2017 (Friday) - History, Chemistry, Accountancy. 25.03.2017 (Saturday) - Statistic, Classical Languages, Modern Foreign Language, Agronomy. 27.03.2017 (Monday) - Political Science, Geology, Sociology. 28.03.2016 (Tuesday)- Biological Science, Home Management & Home Nursing, Business Economics including Business Mathematics. 29.03.2017 (Wednesday) - Anthropology, Economics, Fine Arts & Crafts, Music, Environmental Education. Regular visit for more updates of - WBCHSE HS RESULT 2017 / WB 12th Result 2017. Students please visit the official website (http://wbbse.org) for more information for your MP Final Exam Schedule for 2016- 2017.